Spirits were yet scurrying back to their haunting places when Christopher Eisenbach took to the podium less than fifteen hours after the Bernstein Centennial Celebration to lead the Boston Symphony and the Tanglewood Festival Chorus in the program that would conclude the BSO’s Summer of Lenny in the Berkshires. Like wedding guests who meet for lunch the day after before resuming the routine of their lives, the audience today couldn’t stop talking about what they’d witnessed yesterday. So, let’s get on with it, let’s play the program and put the season to bed. A routine rendition of that splendid chestnut – Beethoven’s Ninth, although never expected here in the Koussevitsky Music Shed, may have been acceptable – just this once. 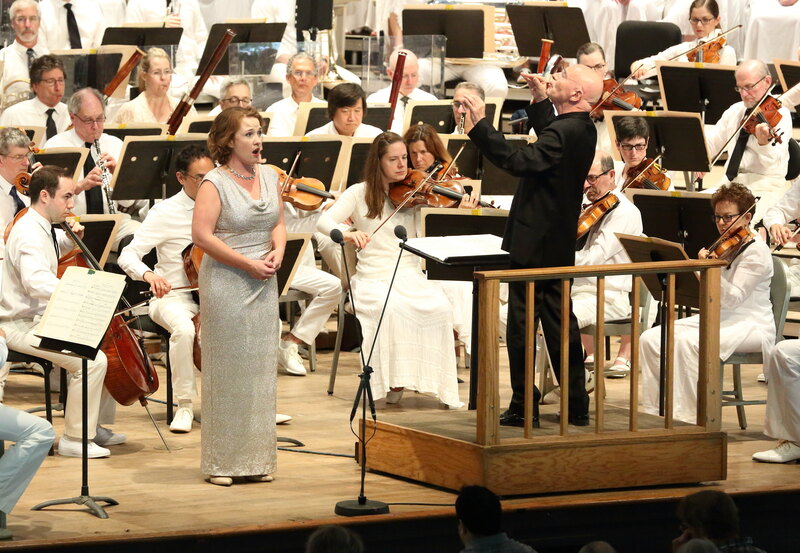 Christoph Eschenbach and Sasha Cooke at Tanglewood August 26, 2018; Hilary Scott photo. What Maestro Eisenbach and his charges delivered, however, was anything but routine, it was outstanding, so brilliant that it cut room for itself in memory, rather than settle for being an appendage to the events of the preceding eight weeks. We can attribute that to the two Bernstein works prefacing today’s program; traditionally, Beethoven has the season-ending concert to himself. Something else added to my enjoyment – two silences, lacunae less than a second in length, but of profound depth – a tremendous bit of artistry, accomplished by a visiting conductor, orchestra, and amateur chorus. Bravo! It was my uncanny luck to be seated adjacent to a woman who sang in the Berkshire Chorus, antecedent to the Tanglewood Festival Chorus, in the news this summer because of policies instituted by director James Burton, in the wake of founder John Oliver’s 45 year tenure. Before the concert, she told me that she sees merit on both sides of the re-audition issue; later, she said that they had never sounded so good. Charles Munch conducted the last program she was part of; and she sang at Maestro Koussevitsky’s funeral!